Helicoverpa armigera (Hübner) is a destructive polyphagous insect pest of worldwide importance. In Indian subcontinent and Southern Europe, the pest causes serious damage to tomato crop. High migrating ability of H. armigera is expected to threaten more area cultivated under this crop. 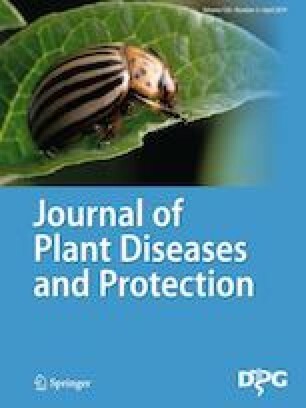 It is therefore important to understand the development of this pest on tomato to predict its phenology well in advance in order to manage it efficiently. Keeping that in view, the development and mortality of immature stages of H. armigera were studied inside plant growth chamber with six different alternating temperatures (Max/Min °C) viz. 25:10, 25:13, 25:16, 30:10, 30:13, and 30:16 °C with 14:10 h photoperiod. Development of all immature stages quickened with increasing alternating temperatures. Tomato-fed larval stage suffered heavy mortality which ranged from 69 to 85% and completed development in 47.4–31.6 days with rising alternating temperatures. The development data of H. armigera immature stages were fitted into various models like simple linear model, Ikemoto–Takai model and Kontodimas nonlinear model. Among linear models, Ikemoto–Takai model estimated lower threshold temperatures of egg, larva, and pupa viz. 9.9, 7.8, and 12.3 °C, respectively. Daily mean temperatures falling below these threshold values likely to be fatal for immature stages of H. armigera. Degree-day estimates were 37.4, 508.4, and 154.6°D for egg, larva, and pupa, respectively. Both linear models were close enough in predicting immature stage duration of H. armigera. The Kontodimas nonlinear model also predicted 32.5 and 37.8 °C as maximum threshold temperature for egg and larva, respectively. The predicted fatal temperatures for immature stages of H. armigera through various models in this study will help to take timely and need-based control measures. Authors express gratefulness to the Indian Council of Agricultural Research (ICAR) for financially supporting this research through junior research fellowship.